Things have been moving quickly in Olympia, with almost 900 bills introduced in the Senate so far this session, I have been busy meeting with constituents and stakeholders to hear their thoughts and concerns on proposed legislation. 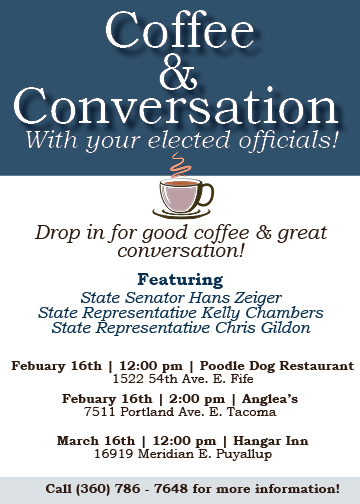 Join Reps. Chris Gildon, Kelly Chambers and myself for one of our Coffee and Conversation drop-in gatherings! Each of my legislative updates will highlight bills I am working on and where they are in the legislative process. 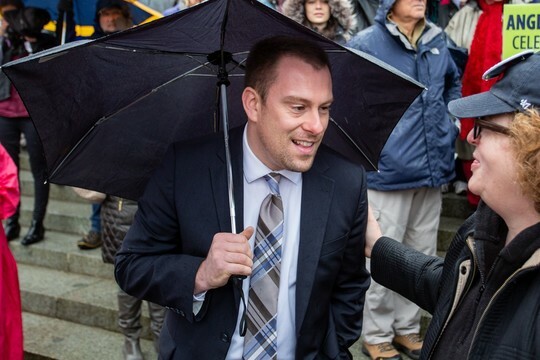 In this newsletter, I would like to talk about legislation I sponsored to create more affordable housing, and to ease the burden of getting a permit for food trucks. Tiny houses. This session I am sponsoring three measures aimed at providing more options for people who may not be able to afford a traditional home. Senate Bill 5384 would allow Growth Management Act counties (Pierce is one) to authorize tiny house communities when there is a shortage of affordable housing within a reasonable distance from urban services. Senate Bill 5382 would allow tiny houses and tiny houses with wheels to be permanent residences without being attached to a primary dwelling unit. Senate Bill 5383 would address the shortage of affordable housing by allowing individual cities and counties to permit tiny houses with wheels to come together as tiny house villages. Another great benefit of these bills is that they will create more jobs for people building tiny homes. We need a larger housing supply for all different income levels. Creating a way for people to site tiny houses in villages and establishing easier permitting processes will benefit our state’s economy. Food truck vendors. Senate Bill 5218, which received a public hearing on Tuesday in the Senate Agriculture, Water, Natural Resources and Parks Committee, would allow food truck vendors who have a valid permit in one jurisdiction to use that permit in another jurisdiction, if they meet certain requirements. This bill also provides some relief to food truck vendors when it comes to the plan review application process. This is a common-sense bill that will be good for our local economies. Recently we have seen the growth of new food-truck businesses in Puyallup, where the city council recently approved a pilot program to relax some of the city regulations on food truck vendors. As always, I value hearing directly from you. If you would like to contact me, please call, email and again, stop by if you’re in Olympia. 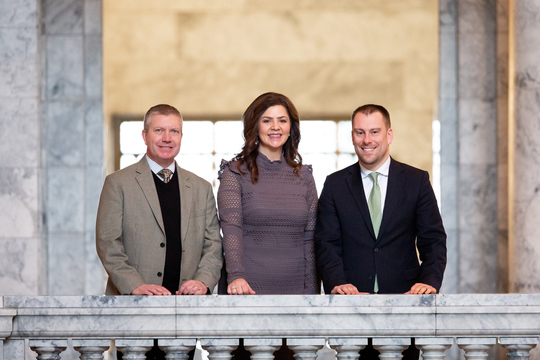 Thanks for the privilege of serving as your state senator. This service is provided to you at no charge by Sen. Hans Zeiger.